Friday was a much lighter day for us. We only ran two events but one of them was just plan ‘monstrous’. 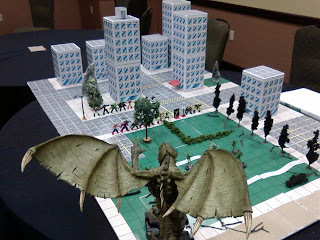 Joe ran his yearly JSA vs event while Dave Wulatin and I ran my Call of Cthulhu event. Joe didn’t start his event until noon today which was good because of the size of the event. Early events some players can decide not to go depending on how their events went the night before and his event was slotted for 18 players! As it turns out someone wanted to get in on the action so Joe let him in with generics. So the grand total of players for Joe’s event was 19! Wow! Joe’s a veteran GM and he handled it beautifully. This years’ event was ‘JSA vs. Cthulhu’. Joe’s ‘JSA vs.’ game utilizes his very unique ‘twist tie superheroes’. These are one of a kind, hand-made miniatures of DC’s greatest heroes. Joe combined these minis, the Wizkid’s Call of Cthulhu large figure and scenery/buildings that he and Bill made. Bill had a big hand in putting the buildings together and they looked great. I went with Joe to help set up on that Friday morning for his noon start. The final set up was awesome. Here’s a photo. I left before the start and Joe was set to run the event by himself. With 19 players he was going to have his hands full but Joe rose to the occasion and came through with flying colors. Joe said it was awesome and everyone had a great time. Joe finished of his day with a nice lunch and resting by the pool in our hotel. Meanwhile Dave Wulatin took the opportunity to have Wil Wheaton, one of the media stars at Gen Con this year, sign his Wesle-Y-KID character name-plaque he uses for his Paranoia Trek event. Nice little touch for someone to have on their name-plaque in the future. The only other event we were to run today was my Call of Cthulhu, ‘Unnameable Basterds’ at 6pm. We had the event slotted for six players but I always make sure I have a couple of extra characters made up in case someone else wants to try and get in. It was a good thing too because we did have a couple of extra and we ended up having a full group of eight. To say that the event went well is an understatement. It was phenomenal! I could not have asked for a better bunch of players. They played their characters beautifully and I had as much fun watching them as they had playing in the event. Here’s a photo of the group, they even hammed it up for the photo! School years. Her name is Angie Louise and she did an incredible job with the sound affects for us. (Click here for her website) Thanks Angie! As usual Dave Wulatin did a great job of helping Co-GMing the event. His surprise blood squib in the mouth made a big impact on the players. It was a great event and it made me very glad, as it does every year, that I run an event. We finished and wrapped up just about midnight and Dave and I heading back to our hotel. We had a great time and my Call of Cthulhu was a big success and hit. Off to our rooms we headed. We had one more day of events to run with our biggest event ‘Can of Whupass’ yet to come on Saturday night.